You can get an almost 9% yield on this cheap stock in 2017. 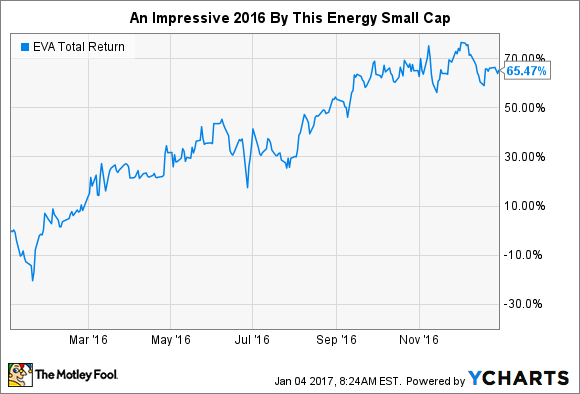 After years of miserable returns, the market finally threw the energy sector a bone in the second half of 2016. But while the big boys enjoyed mildly positive returns for the year, there was a small, high-yield energy company that bested them -- and it still looks cheap. That company is Enviva Partners (NYSE:EVA). It is consolidating the market for harvesting wood pellets in the American Southeast and sending them to power plants, primarily in Europe, that need energy inputs to replace coal. Demand continued to boom throughout the year, but the stock -- and its 8.7% dividend yield -- still remains favorably priced. Why was 2016 such a good year? Enviva only went public in the middle of 2015, and many investors were in a wait-and-see mode. The company was founded by current CEO John Keppler in 2004 and toiled in renewable energy for half a decade before demand started to surge for wood pellets around 2010. European energy producers, mandated to wean themselves off of coal, needed new inputs. Two companies -- Riverstone and The Carlyle Group -- pumped lots of capital to help Enviva scale production. In 2015, the group decided to take the company public. The company's primary business objective was "to increase [its] per-unit cash distributions over time." Enviva signed long-term contracts with energy producers that guarantee a steady and reliable flow of revenue. The company then leveraged its properties -- strategically placed drop-down production plants and a wholly owned deep-water dock in the Port of Chesapeake -- to cut down on costs and squeeze out cash flow from the process. Steady growth in the company's backlog to ensure long-term viability. Increase in the dollars per metric ton earned by the company to ensure leverage. Increase in the distributable cash flow (DCF), which is what determines dividend payments. Here's how the company fared in all three of these categories since going public. Data source: Corporate SEC filings. Enviva closed long-term contracts with Lynemouth Power of England in the second quarter, and a contract with the UK's MGT Power became finalized in the third quarter. Both of those account for the dramatic jump in the backlog throughout the year. Management has also mentioned that it expects demand from Japan to pick up soon -- so that will be worth watching in 2017. The jump in the gross dollars per metric ton has also been encouraging. Since the third quarter of 2015, it has increased 31% to $44.39. With the acquisition of the Sampson plant in North Carolina having been completed in December 2016, investors should watch to see how rapidly this figure continues to grow. The rubber really hits the road -- for dividend investors, at least -- with the growth of the company's DCF. Management has stated time and again that it shoots for a coverage ratio of 1.15. In effect, that means it wants enough DCF to cover 115% of its dividend payments. The inverse way of looking at it is to say that the company wants to use 87% of its DCF to pay its dividend. But Enviva blew past those expectations this year. During the third quarter, the coverage ratio was 1.57 -- and over the past year, it now sits at 1.4. With DCF continuing to grow, as well as the backlog, and the average contract now lasting a decade, you can see why dividend investors should be excited. That hasn't really happened though. Right now, shares are trading for just about nine times DCF, and the company is yielding 8.7% -- based on management's expected 2017 distributions. Those are very enticing figures. I wouldn't be surprised to see shares advance in 2017 as a result. If Keppler and company can make the adjustments necessary to keep expanding those margins, it could be a banner year for the company.